As 2019 softwood lumber selling resumed following the holiday break, prices of quite a few standard construction framing dimension lumber commodities remained flat while others popped up or dropped down slightly depending in supply and customer inventories in the field. Producers and resellers received plenty of calls for inquiry, but booked much fewer sales as buyers chose to sit back and wait for prices to drop before committing to more purchases. Order files at most sawmills were approximately two weeks, however specialty and custom items were out to the week of January 28. As with the end of 2018, demand for 2×6 sizes remained hot. Prices of that item were strong, at the start of this New Year, with benchmark Western Spruce-Pine-Fir KD 2×6 #2&Btr up $27, or +8.9%, over the end of last year, to US$332 mfbm from $305. As the current contract on the Chicago Mercantile Exchange raced toward the January 15 expiry, trading of softwood lumber futures switched largely to the next session. Current prices on futures reflected a close proximity to cash; always helpful when trying to determine in which direction prices will move in the new few weeks and months. For Thursday, January 11 close, softwood lumber futures ended up $5.50 to settle at US$330 mfbm. The looming March and May contracts were each up-limit, or +$10, to close Thursday at US$346 and US$354 respectively. It remains to be seen, of course, if the cash market will trend upward over the next few months. However, with volumes at almost 3,000, this latest activity on the lumber futures board does indicate a rather bullish attitude on the part of industry. Weather provided quite some consternation across the continent, particularly in the Canadian east. Eastern Spruce-Pine-Fir sawmills reported transportation problems, and indicated that most of their business last week came from US customers. Southern yellow pine lumber prices started this new year in a slump. 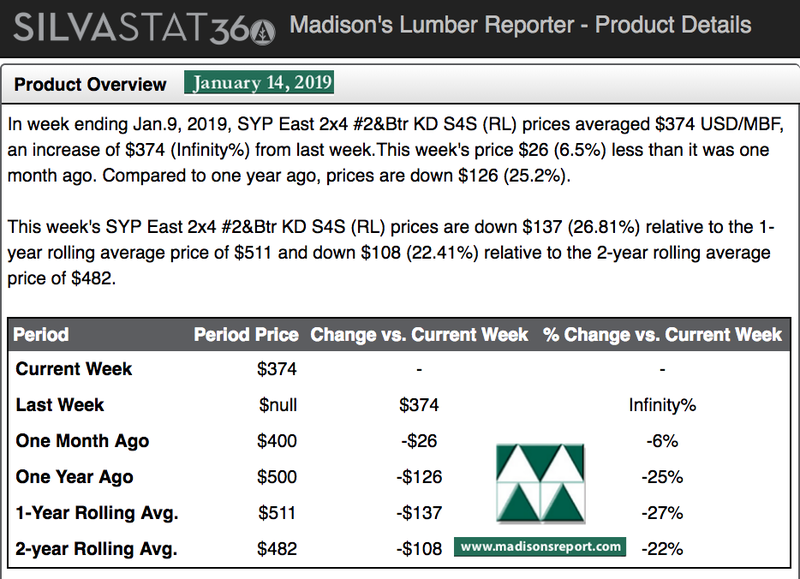 Prices for the January 11, 2019 issue of Madison’s Lumber Prices matched their 2018 low point that came just three weeks before. Madison’s print on Southern Yellow Pine KD 2×4 #2&Btr — the closest competitor to benchmark WSPF — was US$374, dropping $21 or -5.3%, from the previous week’s US$395. Not surprisingly, both orders and shipments of southern pine lumber were just under 1 mmbf, which is indicative of the low levels typically seen during this time period each year.